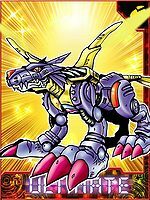 The final form of Garurumon, powered up by metallizing almost its entire body. 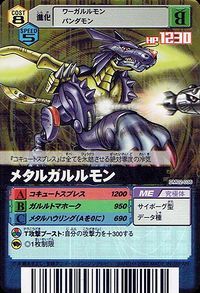 Not only has it retained its natural keenness when it underwent metallization, but it can also pulverize the opponent with the countless weapons concealed throughout its body. 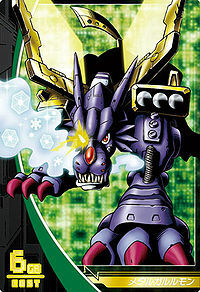 It radiates invisible lasers from the four Laser Sights on the tip of its nose, and because it is able to analyze the targets before it using all of its sensors, such as infrared rays and X-rays, it is impossible to escape Metal Garurumon even when among the darkness outside of its field of vision. Also, it can release beam-shaped wings from the arms extending from its back, allowing it to fly about the Net Space at extremely high speed. 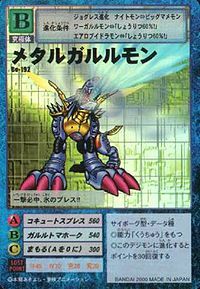 Its Special Move is spewing cold air at absolute zero that completely freezes everything (Cocytus Breath). Anyone that suffers this attack has their vital functions instantly brought to a halt. 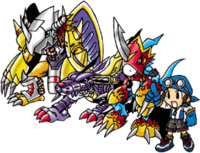 — Digimon Adventure: "Two Great Ultimate Evolutions! Get Rid of the Darkness!" 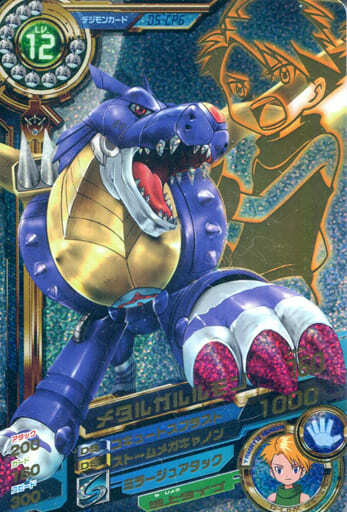 Garurumon takes on this form after metallizing its whole body. It is very fast, and is even able to fly in the sky. It is armed with weapons all over its body, and laser sights on its nose tip which allows it to detect enemies even in the dark. 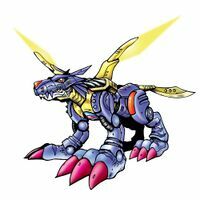 The ultimate form of Garurumon-species Digimon, it powered up without losing its agility by performing metallization of its body. There are many weapons concealed throughout its Cyborg Body. It locks onto enemies with the "Laser Sights" on its snout. It is able to extend beam wings from the arms on its back and fly at extremely high speed. | Garuru (がるる~) is Japanese for the sound of a growl. 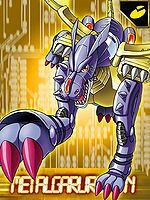 Anime/Manga Digimon Adventure: "Revival! 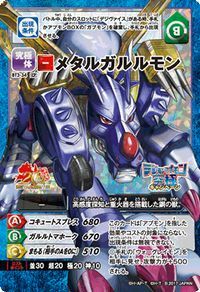 The Devil Venom Vamdemon"
Cocytus Breath  コキュートスブレス Kokyūtosu Buresu Metal Wolf Claw/Metal Blaster/Freezing Breath Breathes out a blast of air that freezes the opponent solid. 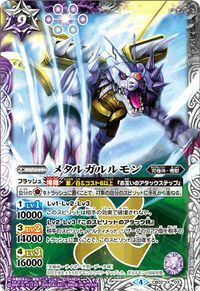 Grace Cross Freezer  グレイスクロスフリーザー Gureisu Kurosu Furīzā Ice Wolf Bite/Ice Wolf/Giga Cross Freezer/Ice Wolf Claw/Metal Wolf Claw Unleashes a massive attack of missiles that freeze the opponent, or freezes them with a beam of blue light. 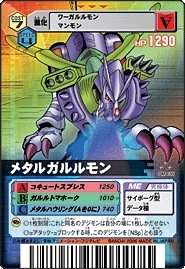 Garuru Tomahawk  ガルルトマホーク Garuru Tomahōku Giga Missile/Metal Wolf Throw/Metal Slamming Attack/Ice Wolf Claw Launches a large missile out of its chest plate, or fires missiles from its shoulders. 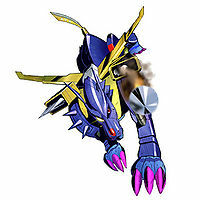 Freeze Bomber  フリーズボンバー Furīzu Bonbā Metal Wolf Claw Launches a missile out of its chest plate that freezes the target. 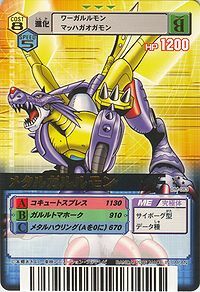 Metal Fang  メタルファング Metaru Fangu Metal Wolf Throw A stronger version of Garurumon's attack Freeze Fang, or an attack that cuts the enemy with MetalGarurumon's wings. Blizzard Attack  ブリザードアタック Burizādo Atakku Blizzard Bash Charges forward through the air, trailing ice from its wings. 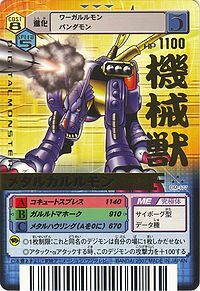 Charges up with glowing red eyes and fires a heavy missile from its chest plate. 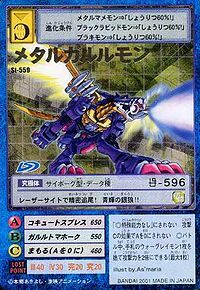 Giga Destruction  ギガデストラクション Giga Desutorakushon Burst Wolf Claw Launches a barrage of missiles from its back. 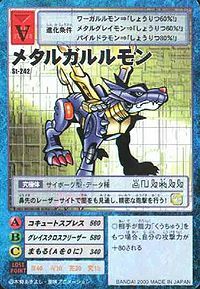 Metal Scratch  메탈스크러치 Metal Seukeuleochi Metal Wolf Claw Slides forward, trailing ice behind it, and scratches the enemy with icy claws. Attacks the enemy with a powerful howl. 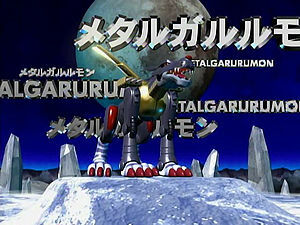 Metal Garurumon is the partner of Ishida Yamato. 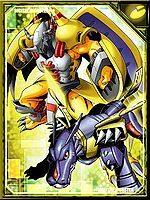 During the fight with Venom Vamdemon, Gabumon and Agumon first learned to evolve to the Ultmate level when Yamato and Taichi were shot with arrows of hope and light by Angemon and Angewomon, and from there they defeated Venom Vamdemon. He was also responsible for the defeat of Pinocchimon of the Dark Masters. 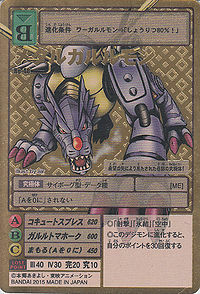 Gabumon later lost the ability to evolve to Metal Garurumon when Yamato surrendered his Crest of Friendship. 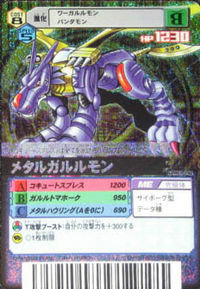 A blurred image of Metal Garurumon appears during the explanation of Izumi Koushiro about how Jogress Evolution works. 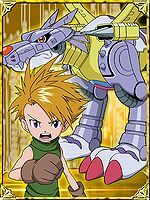 Though Metal Garurumon doesn't have a chance to appear in the sequel, Gabumon briefly evolves to him on his way to becoming Omegamon. 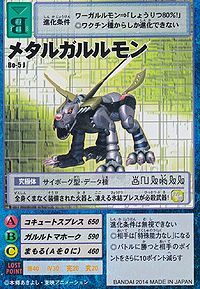 A Metal Garurumon by the name of Melga/Merūga is one of the partners of Fujimoto Hideto of the Alias III. 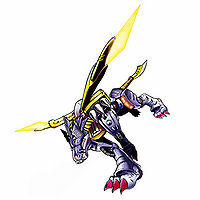 He can jogress with Hideto's other partner, Warg/Org, to become Omegamon. 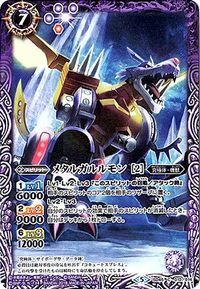 Metal Garurumon is an obtainable Digimon. 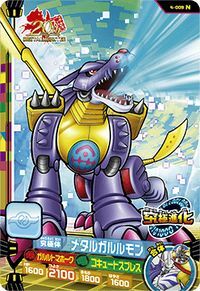 Evolves from Insekimon (0-19 DP) or Were Garurumon (8+ DP). 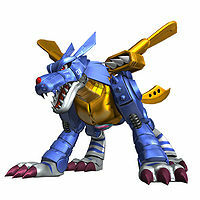 Metal Garurumon is a playable Digimon. 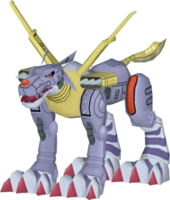 He can be evolved from Gabumon, and is unlocked as an individual playable character once the game is completed with Gabumon. 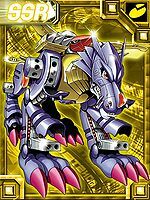 Metal Garurumon is an obtainable evolution for all partner Digimon. 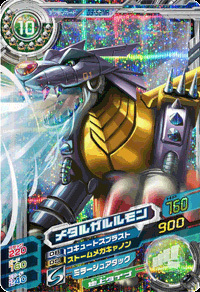 He evolves from Metal Mamemon at Level 40 with 190 Machine experience. His special is Cocytus Breath. 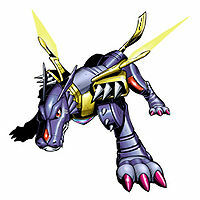 Metal Garurumon is a playable Digimon who evolves from Garurumon. 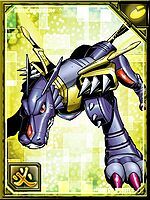 Metal Garurumon is an obtainable Digimon. 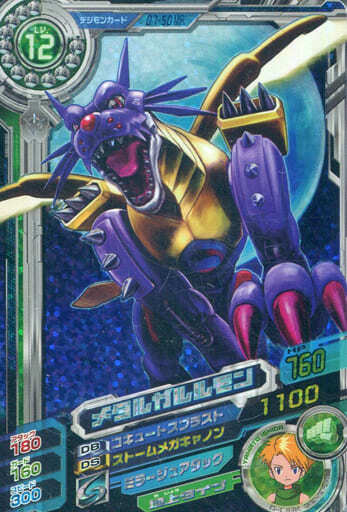 He can be evolved from Were Garurumon if above level 45 with at least 90% Friendship. 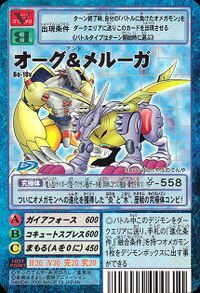 Metal Garurumon can be evolved from Were Garurumon if above level 52 with at least 90% friendship 90%, if Gabumon has already been befriended. 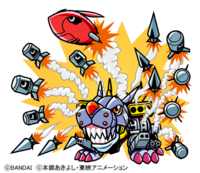 In Sunburst, in Dark Moon CITY, Punch will be using Metal Garurumon against you. 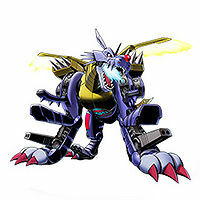 Meteal Garurumon is an obtainable Digimon which is evolved from Were Garurumon, and can evolve to Omegamon. It can also be obtained as a collectible card. 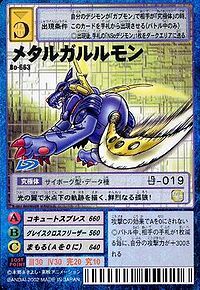 Its card is part of the the Garurumon Evolution (ガルルモン進化 Garurumon Shinka) set, the Metal Digimons (メタルデジモンズ Metaru Dejimonzu) set, and the Jogress Evolution 2 (ジョグレス進化その２ Joguresu Shinka Sono Ni) set. 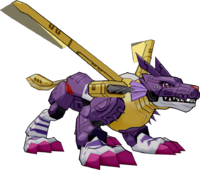 Metal Garurumon is the main evolution of Gabumon, one of the twelve playable characters. It can also be obtained as a collectible DigiCard. 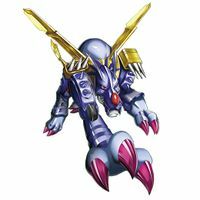 Metal Garurumon is a Digimon obtained by Jogressing Knightmon or Big Mamemon with a compatible Digimon. 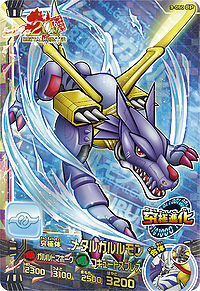 Metal Garurumon is a Jogress Digimon. 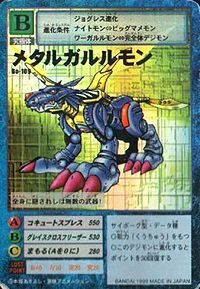 It is obtainable by Jogressing Were Garurumon or Metal Mamemon with a compatible Digimon. 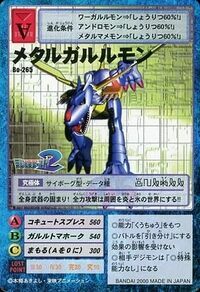 It can evolve to Omegamon if Jogressed with War Greymon. Evolves from Blossomon, Megalo Growmon, Shawujinmon, Tyilinmon, or Yatagaramon. 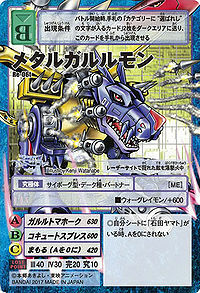 Metal Garurumon can be evolved from Were Garurumon with -2 Calls, Perfect Conditions. The laser site on its nose allows it to see in the dark and carry out precise attacks! Its laser site allows it to carry out precise tracking! A silver wolf that shines with blue light!! Countless weapons are hidden all over its body! Its breath of ice always hits in one strike!! Its whole body is a cluster of weapons! Its all-out attack turns its surroundings into a world of fire and ice!! This vivid lone wolf leaves subzero trails with its wings of light! This blue steel beast surrounds itself with a super high speed barrage! Its special weapons are its freezing breath, and the firearms equipped all over its body! 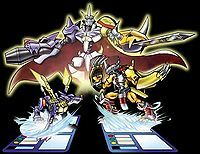 Fire and Ice, the combination of Ultimates with a long history of battles, have finally acquired the evolution to Omegamon! This miraculous Ultimate level was created from an arrow of hope! Its laser sight allows it to accurately bomb even hidden enemies. Its "Cocytus Breath" is a frigid blast of absolute-zero air that freezes everything. 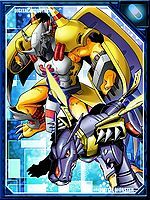 A Cyborg type Digimon who boasts a fully metallised body and sturdy armor, as well as countless weapons equipped all over its body. With the laser sights equipped on its snout, it is able to detect the precise location of its opponents even in the dark. 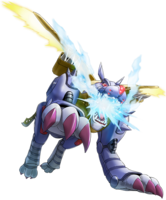 Its Special Move 'Cocytus Breath' involves it spewing absolute-zero air out of its mouth, freezing all matter. 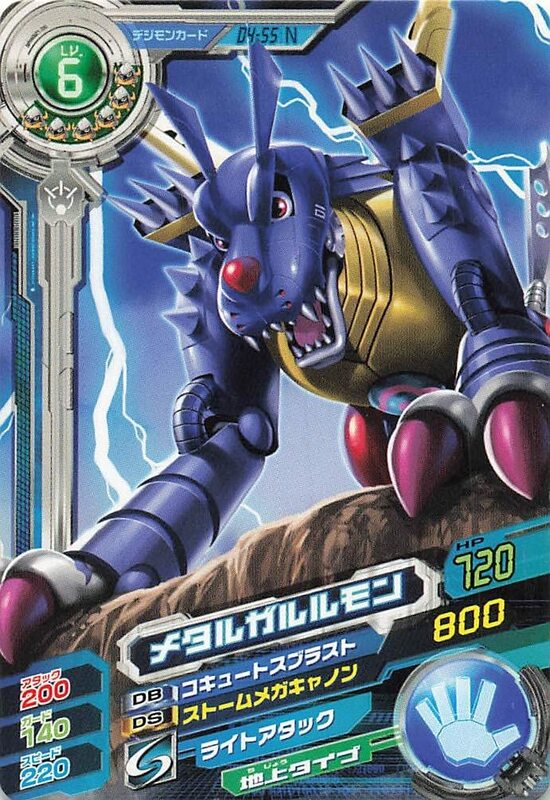 A Digimon that was sealed within Pinochimon's DigiMemory. 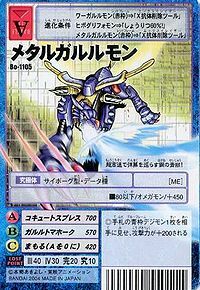 It fell the Tankmon army in a single sweep with its Cocytus Breath. 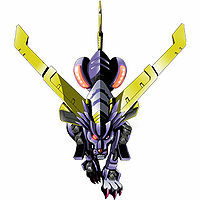 The evolved form of Were Garurumon that resulted after it absorbed the arrow formed from the Crest of Hope. It has forged a strong friendship with its partner, Ishida Yamato. 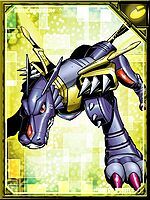 A final form of the Garurumon-species, its whole body has been metallized and equipped with heavy artillery without lowering its speed. It is able to detect enemies using the laser sight on the tip of its nose, and attack by flying at high speeds. This beast of steel is equipped with high sensitivity detectors and heavy firepower. 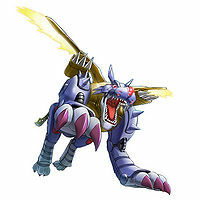 An Ultimate level Cyborg Digimon that is the Warp-evolved form of Gabumon. It ensures its enemies never escape, and is capable of precisely capturing even enemies hidden in the dark by using the four laser sights on the tip of its nose. 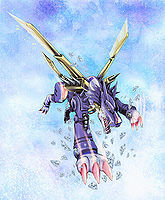 An Ultimate level Cyborg Digimon. 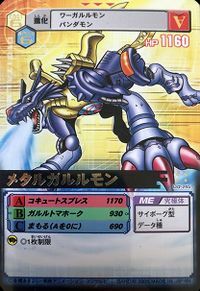 Its entire body has been mechanized with the organic Chrome Digizoid metal, and it attacks by firing its missiles and machine guns with ease. The final form of Garurumon, powered up by metallizing almost its entire body. 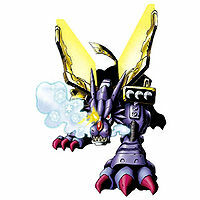 Its Special Move is spewing cold air at absolute zero that completely freezes everything (Cocytus Breath). Anyone that suffers this attack has their vital functions instantly brought to a halt. 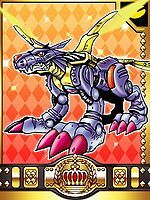 Metal Garurumon can be summoned in the Arcade component of the game by a special 20th Anniversary card. Digimon Adventure Digimon Adventure tri. Digimon Adventure tri. ↑ Digimon Fusion: "Disaster in the Dust Zone!" 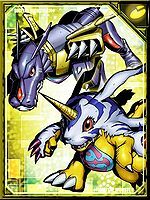 ↑ 6.0 6.1 Digimon Adventure: "Two Great Ultimate Evolutions! Get Rid of the Darkness!" This page was last modified on 10 April 2019, at 18:48.